We know a structure of an atom consists of electrons, protons, and neutrons. This was accurately presented after several scientists came up with different models. The classic model of an atom was given by Ernest Rutherford called the Rutherford atomic model or Rutherford model of the atom. However, it is not considered the accurate representation of an atom anymore. Let us know more about this model. Rutherford proposed that an atom is composed of empty space mostly with electrons orbiting in a set, predictable paths around fixed, positively charged nucleus. The concept of atom dates back to 400 BCE when Greek philosopher Democritus first conceived the idea. However, it was not until 1803 John Dalton proposed again the idea of the atom. But at that point of time, atoms were considered indivisible. This idea of an atom as indivisible particles continued until the year 1897 when British Physicist J.J. Thomson discovered negatively charged particles which were later named electrons. He proposed a model on the basis of that where he explained electrons were embedded uniformly in a positively charged matrix. The model was named plum pudding model. However, J.J. Thomson’s plum pudding model had some limitations. It failed to explain certain experimental results related to the atomic structure of elements. A British Physicist “Ernest Rutherford” proposed a model of the atomic structure known as Rutherford’s Model of Atoms. He conducted an experiment where he bombarded α-particles in a thin sheet of gold. In this experiment, he studied the trajectory of the α-particles after interaction with the thin sheet of gold. In Rutherford’s experiment, he bombarded high energy streams of α-particles on a thin gold foil of 100 nm thickness. The streams of α-particles were directed from a radioactive source. He conducted the experiment to study the deflection produced in the trajectory of α-particles after interaction with the thin sheet of gold. To study the deflection, he placed a screen made up of zinc sulfide around the gold foil. The observations made by Rutherford contradicted the plum pudding model given by J.J. Thomson. Major space in an atom is empty – A large fraction of α-particles passed through the gold sheet without getting deflected. Therefore, the major part of an atom must be empty. The positive charge in an atom is not distributed uniformly and it is concentrated in a very small volume – Few α-particles when bombarded were deflected by the gold sheet. They were deflected minutely and at very small angles. Therefore he made the above conclusion. Very few α-particles had deflected at large angles or deflected back. Moreover, very few particles had deflected at 180o. Therefore, he concluded that the positively charged particles covered a small volume of an atom in comparison to the total volume of an atom. Learn the difference between Thomsons and Rutherford Atomic model here. An atom is composed of positively charged particles. Majority of the mass of an atom was concentrated in a very small region. This region of the atom was called as the nucleus of an atom. It was found out later that the very small and dense nucleus of an atom is composed of neutrons and protons. An atom has no net charge or they are electrically neutral because electrons are negatively charged and the densely concentrated nucleus is positively charged. A strong electrostatic force of attractions holds together the nucleus and electrons. 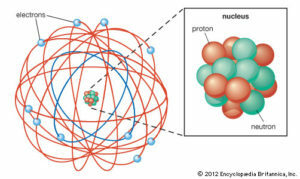 The size of the nucleus of an atom is very small in comparison to the total size of an atom. Learn more about Thomsons Model of an Atom, by J.J. Thomsons, which was first model of Atom. Rutherford’s model was unable to explain the stability of an atom. According to Rutherford’s postulate, electrons revolve at a very high speed around a nucleus of an atom in a fixed orbit. However, Maxwell explained accelerated charged particles release electromagnetic radiations. Therefore, electrons revolving around the nucleus will release electromagnetic radiation. The electromagnetic radiation will have energy from the electronic motion as a result of which the orbits will gradually shrink. Finally, the orbits will shrink and collapse in the nucleus of an atom. According to the calculations, if Maxwell’s explanation is followed Rutherford’s model will collapse with 10-8 seconds. Therefore, Rutherford atomic model was not following Maxwell’s theory and it was unable to explain an atom’s stability. Rutherford’s theory was incomplete because it did not mention anything about the arrangement of electrons in the orbit. This was one of the major drawbacks of Rutherford atomic model. Even though the early atomic models were inaccurate and could not explain the structure of atom and experimental results properly. But it formed the basis of the quantum mechanics and helped the future development of quantum mechanics. Answer: The answer is 4. Rutherford α-particles scattering experiment led to the discovery of nucleus.